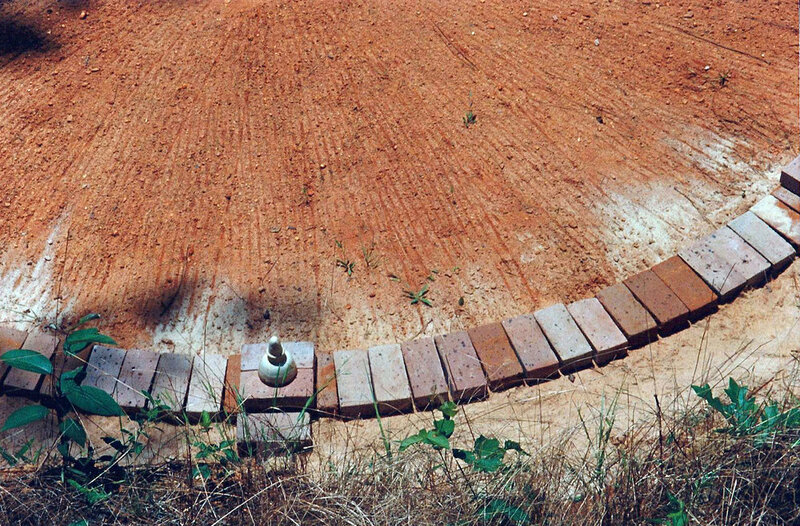 The stupa Is constructed out of broken bricks from demolition sites and soil from the site to form a circular column that reached seven feet above the plaza. 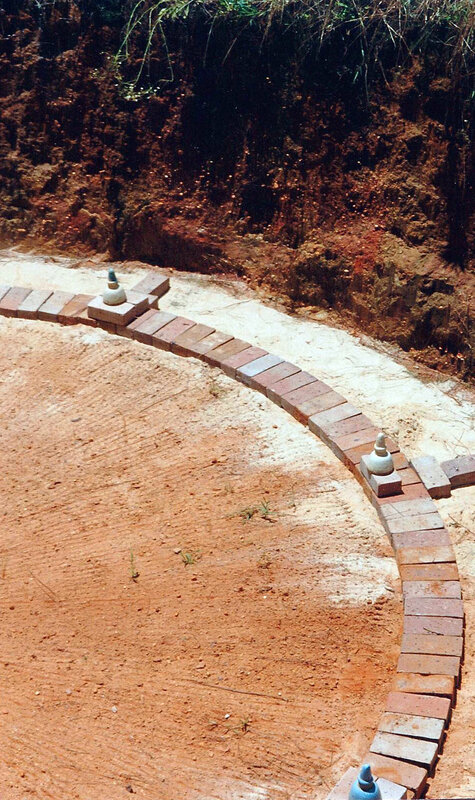 The plaza is a raised circle shaped by 64 chimney flues. 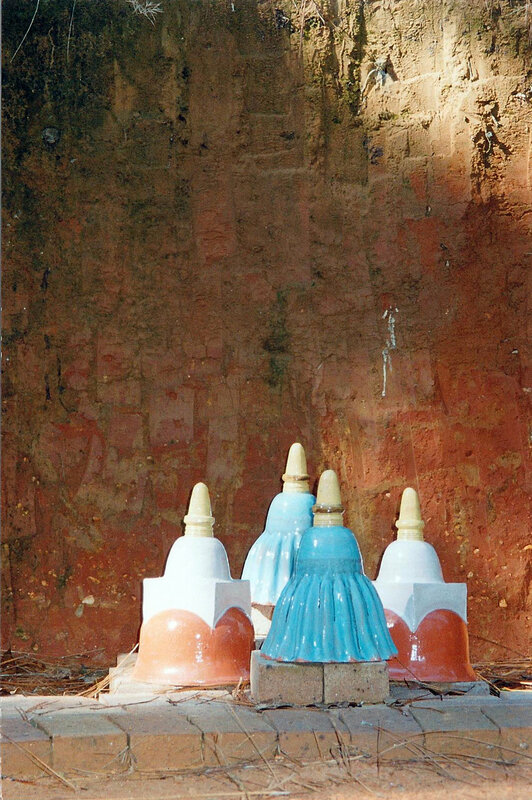 The stupa was left to deteriorate in the rain over the past 5 years it has lost over half its original height. The Buddha Cave, an earth work in progress, sinks a circle 6 feet beneath the level of the hill to form a enclosed space accessible by a seventy-five foot long excavated alley oriented to Spring Sun and the Stupa. The cave houses a circle of brick divided into eight sections with a large niche opposite the alley. The cave is always static and in construction towards a goal of being a domed room. In the early days there were no landmarks on the scrub covered land. The Elephant Spirit House was one of the first points of orientation so visitors would know the way. The house adapts Asian representation of homes for spirits in this case a white elephant. The white elephant is a rare creature and powerful symbol in Buddhist cultures. It is often seen as a protector, and the bringer of good fortune. The structure is constructed from millwork scrap from the project on Exposition Blvd. The plaster elephant was retrieved from the street in New Orleans. The grotto was first assembled in New Orleans using bricks and oyster shells salvaged from Frenchmen Street. The bricks are stacked in a double trabeated arch to house the oyster shells in the manner of an offering. The face of the Oyster Shell Grotto is oriented to Winter Sun. 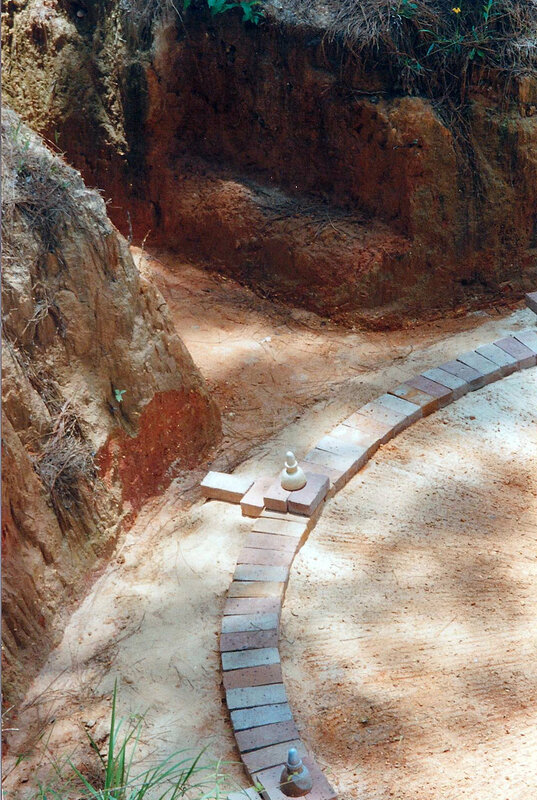 The setting on a wooded path uses a four sided space cut into the forest floor to clay level to separate the stack from the surrounding vegetation. The largest island in the pond has been invested with a tea house “folly” dedicated to Chac, the Mayan god of rain. The structure was constructed from salvaged masonry materials including cast concrete decorative elements from a demolished Mid-City warehouse. The ceramic tile were made by me specifically for the tea house. It is possible to climb to the top of the figurative roof comb to view the surrounding area from more than 24 feet above pond level. The pond is the first large undertaking after the purchase of the land in 1983. It serves as a landscape and recreational element, joining the adjacent property with water and a large open area. 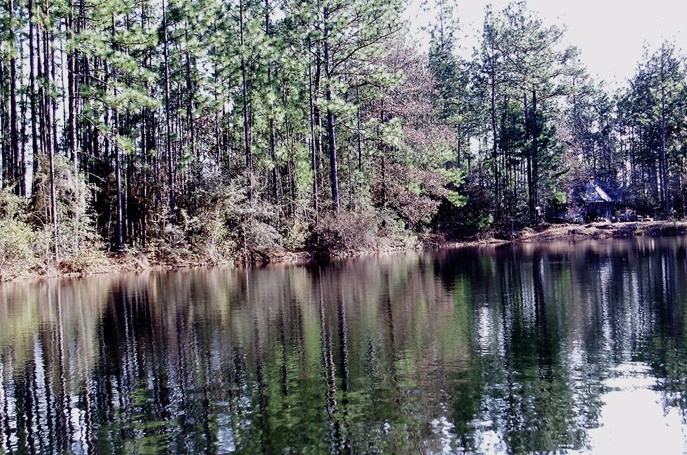 The two acre pond has two islands a cypress peninsula, two bridges and a swimming area.